Uglyworld #280 - "Welcome To Hat Club" (9/365), originally uploaded by www.bazpics.com. With work over until Monday and us staying in Freiburg through the weekend (as we normally always head home every weekend) due to the weather (snow, ice and the TV weather warned of temperatures in the region of -20oC over the weekend) Babo was on my case about getting a hat to keep his head warm when out exploring in the cold weather (he's basically been jealous that Wage already had a hat before him). 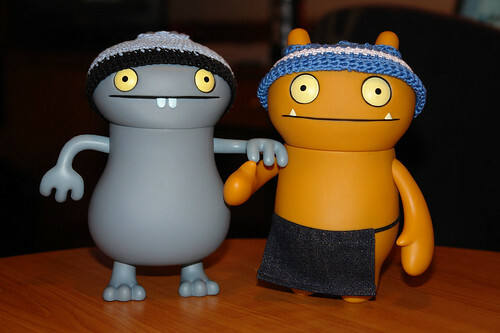 ...luckily I've just managed to put the finishing touches to it in the last minutes, and since then Babo and Wage have been strutting around the hotel room declaring, "Welcome to hat club!" at the top of their voices - I keep expecting the hotel staff to knock on the door and tell me to keep the noise down. They're also practising how they will walk on the ice tomorrow while visiting the 2 cities, it's really funny to watch them hanging onto each other and taking turns at pretending to slide on the imaginary ice.